Why do I name my gardens? I spent the morning out in the garden. I cleaned up some weeds growing in the Garden of Southern Follies and Delights and noticed two of the three camellias have nice big buds on them. I don't know if they are flower or foliage buds, but I take it as a good sign they are starting to establish themselves. After weeding there, I mulched around the camellias and moved on to Plopper's Field. In Plopper's Field, I pulled out, yanked out, cut back, hacked back, pinched back and otherwise cleaned up all the perennials and removed quite a few weeds. Plus, I cut back the Amsonia so it doesn't self-sow itself all over the place. It will most assuredly do that if you don't cut back off those seeds before they mature. 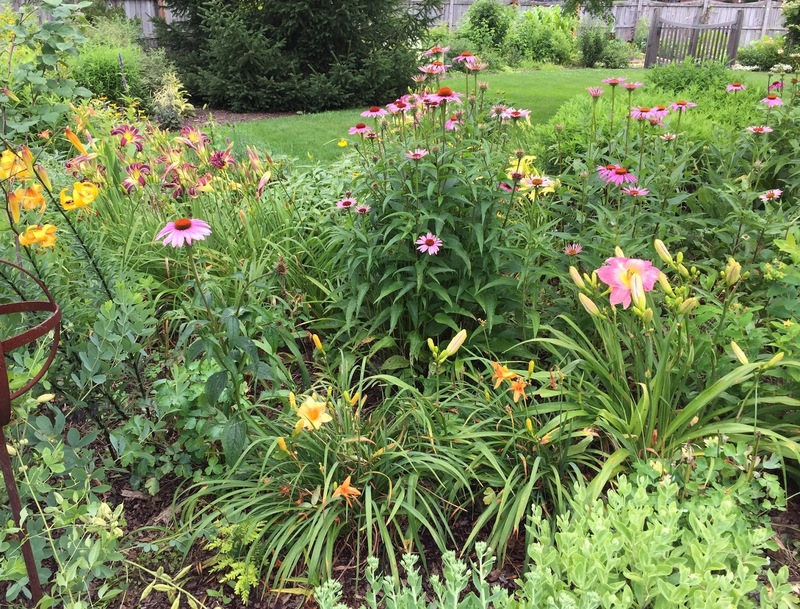 Right now, the day lilies and coneflowers are providing most of the color in Plopper's Field, along with Lilium leichtinii. Satisfied that Plopper's Field once again looked like a garden and not a field of weeds, I moved across the way to Bird's Blanket. It didn't take me long to weed this garden border which is anchored by a large honey locust tree, so then I moved on to August Dreams garden and weeded most of it and the nearby Woodland Follies garden. While I was working on those borders, I also weeded out Ridgewood Avenue, the path that separates them. Then, before I dropped from exhaustion, I weeded the Family Circle and made a quick pass through Hazelthicket, which is the latest name I'm trying out for the garden border along the back of the house next to the patio. Oh my, the patio needs a name, doesn't it? I still need to weed and spiff up The Shrubbery and The Vegetable Garden Cathedral, but I can do that tomorrow morning. Plopper's Field, Garden of Southern Follies and Delights, Woodland Follies, Bird's Blanket, Ridgewood Ave, August Dream Garden, The Vegetable Garden Cathedral, Family Circle, and now Hazelthicket. Why do I name all my garden beds and borders? It personalizes the garden and makes it feel like more than a collection of shrubs, trees, and flowers. It gives the garden personality, too, and helps me when I am referring to different areas. Instead of saying "over there", I can say "in Bird's Blanket", for example. I don't name all the gardens right away. I wait until a name comes to me. Sometimes the name is based on what's growing there, like The Shrubbery and the Garden of Southern Follies and Delights. Other times it is based on how the garden area is planted, like Plopper's Field, where I plop in perennials wherever there is an open space. There are all kinds of reasons for why a garden border is called a certain name. Hazelthicket, the newest name, is so named because there is a large witch hazel in that border, and the rest is a thicket of hostas, hellebores, violets, vinca, and other ground covers. I still have a few areas waiting to be named. I'll do so in due time. No rush, I'll wait for the name to come to me. Now what was the question? Oh, right, why do I name my gardens? Like me, probably named so I can organize where plants are in my mind. I'm not nearly as creative as you with the names, however. Love it! I had names for my gardens at my previous residence. At this one I have named only one- the blue garden! We have names for each area in the garden so that I can tell my husband where to bring my tea or coffee when it is ready! I've named the areas of my garden too, and for similar reasons; however, my names are boring by comparison to yours, referencing the geography of the garden rather than the contents of each area. As the garden matures, though, I'm finding I need to sub-divide into smaller sections so maybe that will prompt me to be more creative on my second pass.